The presence of a new soybean disease was confirmed in New York this week. 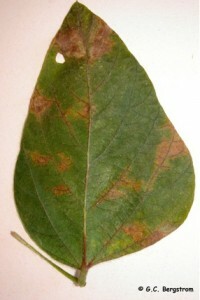 The pathogen is soybean vein necrosis virus (SVNV). It was first described in Tennessee in 2008, and in Arkansas, Illinois, Kansas, Kentucky, and Missouri in 2009. The symptomatic plants in New York came from a soybean field in Ontario County. Symptoms observed in the field were vein-clearing followed by ‘scalded’ reddish areas around the veins and a browning of the veins, especially on the lower leaf surface (see the photo below). Dr. Ioannis Tzanetakis of the University of Arkansas, a leading researcher on SVNV, positively identified RNA of SVNV in samples from Ontario County. In nearly the same time frame as our New York discovery, SVNV has been confirmed in Delaware and Maryland, and with pending diagnoses in Virginia and Pennsylvania. This morning I viewed photographs with symptoms from a field in Herkimer County that also appear to be caused by SVNV; the symptoms were predominantly on the upper, youngest leaves. What is known about SVNV? The answer is not very much. It is thought to be transmitted from soybean to soybean by thrips (soybean thrips and perhaps others). Soybean thrips are observed in New York along with a number of other thrips species. The virus has been placed in the Tospovirus group of plant RNA viruses (stands for Tomato spotted wilt virus) which are transmitted by thrips. Finding it this year doesn’t mean we will find it next year. We don’t know if the virus can also be transmitted through seed or by any other means. We don’t know if it will have an impact on yield. Potentially the virus may be transported long distances by thrips in one growing season or the virus may survive locally in weed hosts (no one has demonstrated this yet) and then be transmitted locally by thrips when their population increases within a season. Tospoviruses are circulative/propagative in their association with thrips, so if thrips survive our winters, SVNV might well survive in the living thrips. Insecticidal seed treatments may have a role to play in killing thrips on young soybean plants and reducing the incidence of early virus infection. Resistant varieties appear to be the main path to sustainable management and several investigators are assessing varieties in other parts of the country. There is no basis to recommend that farmers do anything substantially different now in their cropping practices just because we found this new virus. For now, I would classify its presence in NY only as a potential problem worth keeping an eye on. We encourage growers and consultants to inspect any still-green soybean plants for possible SVNV and to inform your local Cornell Cooperative Extension field crops educator if you find symptoms that are similar to soybean vein necrosis.